Paul's Planes Soling 1-M page! 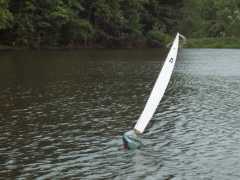 Here is my Soling 1-M. 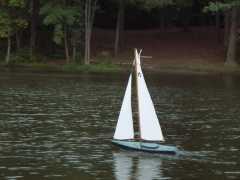 This R/C sailboat is 1 meter long, has 600 sq" of sail, and the mast is 60" high off the deck. The boat weighs the 10 pound minimum set by the class rules, and about 7 of these pounds are in the bulb keel. 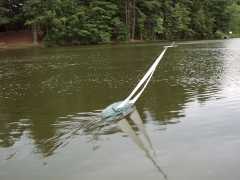 It is a fun, easy boat to sail that is controlled by 2 channels (rudder and sail trim). 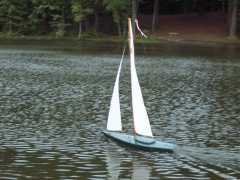 The Soling is a popular one-design racing class of the AMYA. 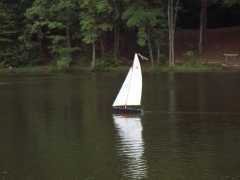 Below the Soling is sailing at a pond near my house, it's the perfect thing to do when it's too windy to fly! Click on any of the pictures to see them full size.